Now that we are into February I am starting to see the parking lot at the gym empty a bit and all the new people in my barre classes come less frequently. I know the new year can be a time where a lot of people are wanting to get into a fitness routine. But maybe you haven’t found yours yet? If you are trying to get back into a fitness groove this post is for you! Join a new gym/class/service: I have used ClassPass a few times which I LOVE! I think it’s a great way to try a bunch of studios out and find where you like to go. I know they also have open gym times on there at certain smaller gyms. So it’s a great way to see a place you may like to get a long term membership to! Talk to people who workout there too: When I used to take barre at my first barre studio I went to the same class everyday (shout out 5:30 class)! I made friends with girls in the class as well as instructors, so it was really fun to go and see them! It was a great motivator. We would go to happy hour or grab food after sometimes too! Treat yourself to a new outfit: You don’t have to say treat yourself to me twice! I love new workout clothes. But maybe if you are having a hard time motivating you can treat yourself to some new leggings, or a new workout top! I will link some of my favorites below! Find something you can do at home: There are just days I can’t make it to the gym. So we have a gym at home that I love using! There are also amazing apps like Apptiv that you can use for workouts. There are tons of YouTube yoga and barre videos as well. Set a goal: Maybe your goal is go workout 4 times a week, or fit into a dress for a vacation. Just set some kind of REALISTIC goal that you have to motivate you to do it! 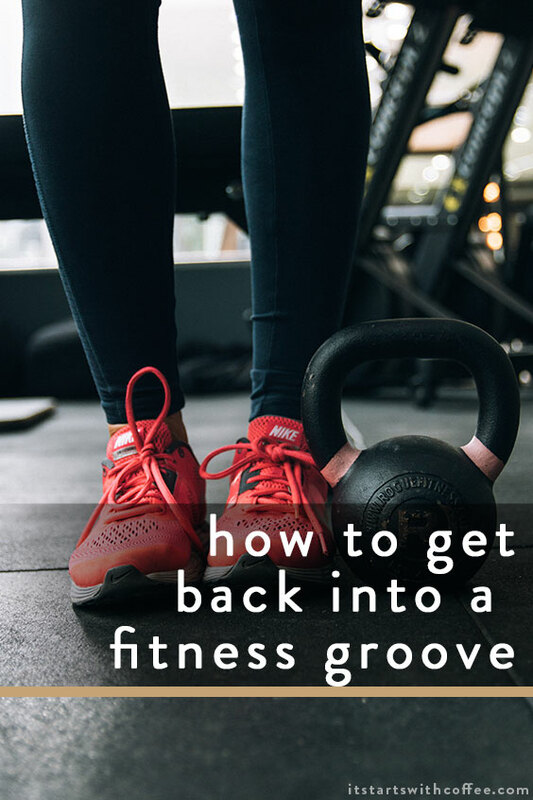 I would love to know how you get back into a fitness groove! Tell us below! Getting cute new workout clothes I’m excited to wear is definitely key for me! Treating yourself to a new outfit is great because if you look great then you may feel better about working out! I probably have too much workout clothing but I love it! My motivation goes out the window when it’s cold. Luckily, we are hitting more days in the 70s than not lately, so my son and I are riding bikes to school again. He loves riding bikes, so it’s a great motivator! Finding ways to work out at home has saved my fitness routine! I gave up a gym membership a long time ago when I realized I wasn’t going as often as I should. But something about being home and seeing my exercise bike right here in my office motivates me to take the 30 minutes and just hop on and pedal. Plus it doesn’t hurt that I can control the TV while I’m working out too. I am STRUGGLING with this right now. Between my stress with the weather and being worn out from work it’s hard to want to exercise. But I will get back to it one day. During winter time, I always loose my fitness groove. Is’a all the cold and dark outside :)) I can’t wait for spring to come! These are great tips! I think treating myself to a new outfit always helps me get back into the swing of working out because it just generally makes me feel better about myself! I definitely need to find something I can do at home because it’s been so home I don’t like to run outside alone!!! Great tips! One of the things I am trying lately (when weather permits) is taking short walks more. Especially to run errands (eg walk a mile roundtrip to get more milk vs. driving). It really helps when I don’t have time for a full workout. Finding ways to work out at home really does keep me on track. Sometimes you just don’t want to go anywhere or have people see you looking sweaty, so at-home exercises are perfect. This is such great advice I do need a lot of help getting back into routine even if it starts out slow! These are great tips! I found joining a Zumba class really helped me as it was a great fun way to exercise, which made me really want to go! Goal setting is the best way for me to get into the gym!